My first Otterbox case was the Defender Series for my iPhone 3GS. That case was so perfect for field work that when the iPad debuted in April of 2010 I couldn't wait to get the Otterbox case for it. It took them a couple months to develop the case, but, when they did, it was awesome. There have been ups and downs since then, but this next round is simply perfect. Let's get into it. Until now, I’ve only ever had the Defender Series cases from Otterbox. When I bought my first one, it was the highest level of protection they had. Now, there are two levels above that. The first Defender Series case consisted of hard-moulded plastic wrapped by silicon. It was a solid case and always provided great protection. The only issue I ever had was with the flap over the headphone jack. With a high amount of use the flap started to tear at the hinge point. I would have had the case replaced but it lasted until I replaced my iPhone with the iPhone 4S. The iPhone 4S Defender case was the most problematic of the cases I've owned. 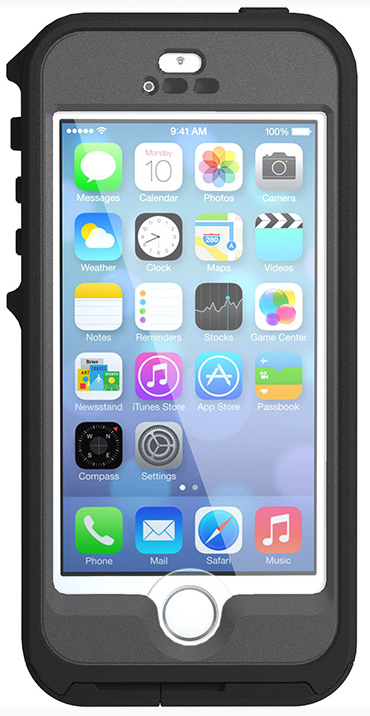 To correspond with Apple's design change from rounded edges to more squared off edges, Otterbox changed the case. The silicon covering they used, however, was way too rigid. If you had to take the phone out of the case more than a few times the silicon became stretched out and never really went on quite right again. It was very frustrating. I had that case replaced once, for free, when I couldn't handle it anymore. When you buy a case, unless you're made of money, you are probably committed to it until you get a new phone, which for most people is two years. These cases don't come cheap. That's why I didn't buy the Armour Series case when it came out last summer. This case is supposed to be virtually indestructible. I was determined to get it when I got my iPhone 5S in September. Then I saw the Preserver case. I was about to switch to Lifeproof Cases because I wanted a waterproof case and one that wasn't as bulky as the Armour Series case. The brand new Preserver series is just that. Also, the Armour Series isn't available for the 5S yet. Aside from being solidly built and not bulky,this case is waterproof (submersible to 2 m for 30 min), can take an impact, has IP 68 dust protection (I don't know what that is but it sounds pretty badass! ), won't let your phone get scratched, has a built in screen protector, and consists of only two pieces that snap together. This is the first high-level protection case without a silicon-outside that I've owned. It's slick, but has rubberized areas in all the right spots. That means it won't catch on the fabric in your pocket but it's not too slippery that you'll drop it either. On the base of the case are two very thick, rubber, openings where you can access the headphone jack and the power connector. The openings are extremely robust and this could be a point of breakage down the road. We'll see. Even the fingerprint scanner in the home button works! Water Protection. Check out the video I made regarding the case’s water protection. I’m impressed! The video won’t play on mobile devices because of licensing restrictions. I used a CCR song for the video and don’t really want to take it off. Enjoy and comment. The Defender Series case for the iPad 1 consisted of two halves of moulded plastic surrounded by a silicone covering. There was an included, separate, screen protector that you had to install before you put the case on. I never liked the screen saver from Otterbox and quickly replaced it with an Invisible Shield from Zagg. The iPad cases have always included a separate, plastic, cover for the screen that can double as a two-position stand when the internal lever is raised. On both my iPad 1 and iPad 2 cases something went wrong with the screen cover / stand piece. In the iPad 1, the lever broke. The plastic hinges couldn't take the repeated use. The iPad 2 had a totally redesigned hinge and worked much better. They skimped on the corners of the cover, though, and I had pieces break off from wear on two separate covers. Otterbox always placed them for free. The silicone on the iPad 2 had the same problem as the one on the iPhone 4S case. After repeated removals it became stretched out and barely fit. I’m sure they would have replaced it, had I asked, but I just sold it and bought an iPad Air instead. This is the best case yet! The plastic is very solid and goes together very well. In the past, the clips on the edges were prone to breaking, but, these have been redesigned and are much more secure. The hole for the camera has been augured out a bit to allow more light to come in. The silicone covering is extremely tight and feels like it won't loosen up over time. The iPad 2 case felt softer from the get-go and eventually loosened up. The screen cover/stand is especially robust. They reinforced the corners where the iPad 2 case kept breaking and the stand hinge has been reinforced as well. The overall construction of the cover is more robust and should last the life of the iPad. There is now a screen protector built in to the case. Previously, the screen protector was a separate piece that you installed prior to putting the case on. It seems like a good screen protector, but, I'll probably still remove it and install one from Zagg. What case do you use? Still putting your phone in a zip lock? That's what I used to do when I worked in the South, back in the "dumb" phone days. Leave your thoughts in the comments.